A major national healthcare provider is taking a stand to “Slug the Flu Bug” by offering flu shots to all 180,000 patients who receive care at Fresenius Medical Care North America (FMCNA) dialysis facilities, and to the company’s 50,000 employees across the country, at no cost to the recipients. Besides the shots, FMCNA, the nation’s leading network of dialysis facilities, has launched a company-wide awareness program to educate staff and patients about how to avoid catching or spreading the flu virus, while strongly encouraging that they and their families get vaccinated every year. Flu – a contagious and potentially fatal respiratory illness carried by airborne viruses and spread by sneezing and coughing – affects millions of Americans each year with symptoms of fatigue, fever, chills, aches, congestion and coughing. Yet the consequences can be much worse for vulnerable segments of the population like people with chronic kidney disease (CKD) and kidney failure. Their condition, and the demands of their life-sustaining treatment, leave them at greater risk for complications related to influenza. 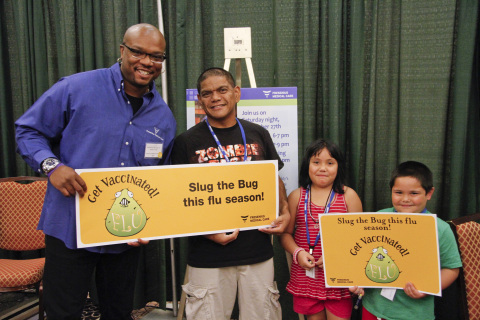 To kick off its awareness campaign about the importance of flu shots, FMCNA provided flu vaccinations at no cost to those attending this year’s National Patient Meeting of the American Association of Kidney Patients (AAKP) on Sept. 26 and 27 in Las Vegas, Nev. The annual meeting gives patients and their families a chance to meet with health care professionals and academic experts, and learn about the latest developments in kidney disease care. The company is also sponsoring a variety of awareness efforts by AAKP to encourage flu vaccination throughout the entire renal community. Senior FMCNA executives have also been getting vaccinated in recent weeks, while issuing a “vaccine challenge” to other employees and patients to participate in the company’s flu shot program. To further encourage full participation, FMCNA has agreed to donate $1 for every patient and employee vaccinated through this program. The donation, expected to exceed $200,000, will be allocated among charities supporting renal patients, and to the company’s employee support fund, which provides assistance to those providing renal care who experience medical emergencies within their families, or are affected by hurricanes, tornados and other disasters. FMCNA is committed to ensuring the health of its staff and patients during flu season by offering vaccinations at no cost and practicing effective infection control. Patients should inquire at their local dialysis clinic for locations and times of specific vaccination opportunities. They can find additional information about flu precautions and other ideas for staying healthy on FMCNA’s patient website: www.ultracare-dialysis.com. For more information about the company, visit www.fmcna.com; for information about patient services, visit www.ultracare-dialysis.com. AAKP is a voluntary non-profit organization founded by kidney patients, which for 45 years, has been dedicated to improving the quality of life of kidney patients through education, advocacy and the fostering of patient communities. The programs offered by AAKP inform and inspire patients and their families to better understand their condition, adjust more readily to their circumstances, and assume more normal, productive lives in their communities.